Training on fish disease investigation techniques was organised and facilitated by Dr Susan Gibson-Kueh from Murdoch University, and co-funded by The Crawford Fund. 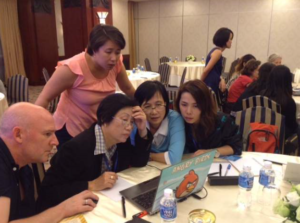 The first of its kind, the training was based on real case studies and digitised fish histology slides and was held on two evenings during an Asian Aquaculture Symposium in Ho Chi Minh City. Dr Supranee Chinabut, a senior adviser to Fisheries Department, Thailand, and Dr Andy Shinn, FishVet Group Asia, co-facilitated the sessions. It was attended by 19 participants from nine countries: Saudi Arabia (1), Singapore (3), Israel (3), Thailand (4), Brunei (1), Vietnam (3), Philippines (1), India (2) and Australia (1). Participants have developed skills and knowledge for conducting sound disease investigations in finfish, to support disease control and optimize production levels in an increasingly important aquaculture industry. The workshop has also allowed participants to build relationships with one another for professional networking in the future.